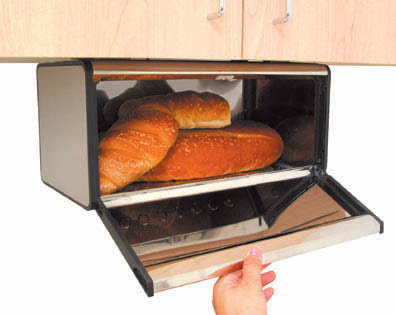 Jeri’s Organizing & Decluttering News: Bigger Than Which Bread Box? What's the best way to store your bread? All the experts seem to agree that the freezer is best for long-term storage, and the refrigerator is never a good option. But what about bread you're going to use in a day or two? After 1–2 days, you may choose to transfer the bread to a sealed plastic bag to maximize freshness. 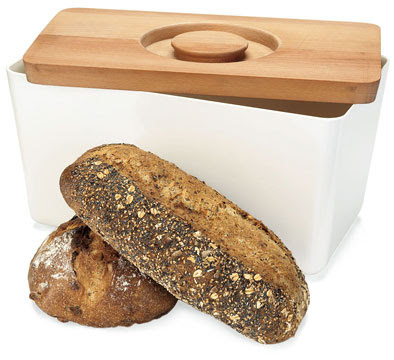 The best way to store bread is to use a breadbox, preferably made of clay. Keep loaves at room temperature in a dark, dry place such as a drawer or bread box - sunlight can cause them to dry out and humidity induces mold. . . . Before storing, cover bread in plastic wrap, and place it in a tightly closed plastic bag. If you have baked your own bread, be sure to let it cool completely before wrapping. For store-bought bread, the plastic bag the bread came in was just as effective as any of the bread keepers we tested - just keep it on the counter. For artisanal or home-baked bread, the reusable, washable twill bag from Best was the most successful at minimizing moisture loss and keeping the crust crisp. . . . Bread boxes should not be used for primary bread storage, but they provide an alternative to keeping bags loose on the counter. 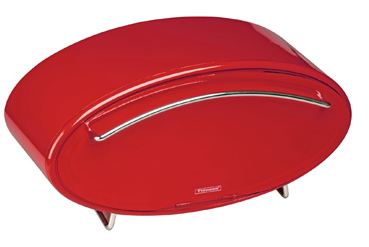 The Typhoon Retro Buick bread bin is another eye-catching option. 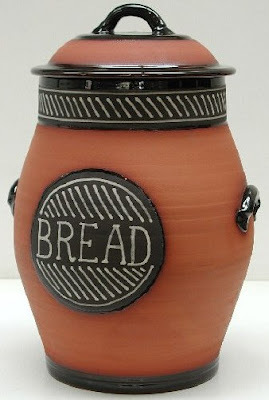 I'd never heard of the British bread crock until a hour ago! The one shown above is from Richard Baxter. If countertop space is an issue, there's the under cabinet bread box. Update on July 9, 2009: Sadly, this product doesn't seem to be available any more. 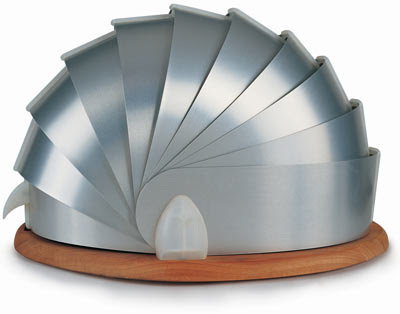 The MoMA (Museum of Modern Art) Store has this melamine bread box where the top can serve as a cutting board. Update on July 9, 2009: This is no longer sold by MoMA. However, it seems to be the Joseph Joseph bread bin, which you can read about here. Famous Parisian bread maker Lionel Poilâne has designed a bread box "especially conceived to keep a half loaf of Poilâne bread fresh"; it also serves as a cutting board. What about critters? Wouldn't leave a bread box on a counter in MY NYC apartment. . . . Anonymous, that's a very good point for those living in areas where critters are an issue. The freezer option might work best for you; I know that's how my family in Florida stores the bread. I just read where someone stored bread in the rice cooker to keep it safe from the cockroaches. Might this Stay Fresh bread container work? There's also this version. i just got the pink, typhoon bread box. i am kind of disappointed to find out that i still need to plastic wrap it first. is this the case? Mavis, the experts I quoted do recommend wrapping the bread. 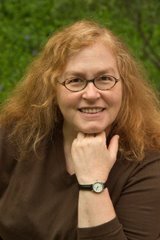 Here's one more such recommendation, from Cheryl Mendelson in the book Home Comforts: "Bread that you are going to use soon should be wrapped and stored in the pantry, on the counter or shelf, or in a bread bin, at room temperature. Wrapping prevents the bread from drying out. However, if you leave the wrapping a little loose around the bread, this may help prevent moisture from condensing and thus help prevent molding. To keep Italian or French bread crusty, use a paper wrap or bag, and be sure to use the bread quickly."